2018 has seen a bit of a jump in the number of roguelike experiences hitting store shelves; the space has become quite crowded of late and developers really have to try and stand out amongst the crowd now. 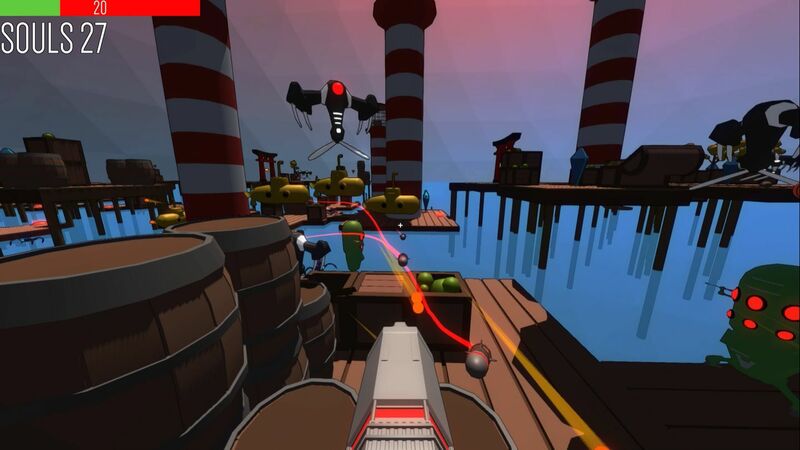 Enter Polygod then, a genuinely unique take on roguelike with a blend of fast paced FPS and a punishing difficulty curve. This one takes an iron will to overcome! 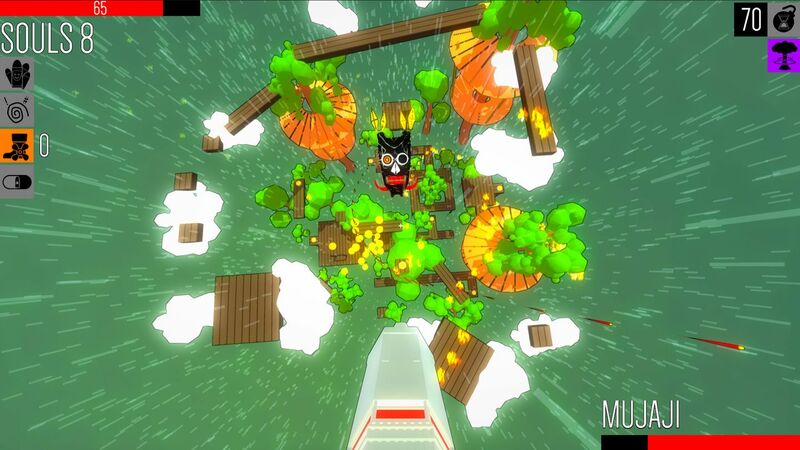 The first thing that’s so noticeable about Polygod is the art style. Flat, brightly coloured textures adorn every level and each feels like a maze. For what it’s worth I’m not a huge fan of this, the game feels sterile and devoid of life, the levels don’t seem to flow well either with many of the randomly generated areas leading to empty rooms or dead ends and this can see it become very frustrating. Don’t get me wrong I’m sure some will enjoy the unique art style, but for me it lacks detail and any clear signposting. The premise of Polygod – or lack of it – is simple; run, jump and shoot everything that moves to collect souls, avoid taking too much fire and spend the souls at randomly generated points to receive blessings, beefing yourself up to take on bigger and more difficult monstrosities. There’s basically no story here, the intro area allows you to talk to a few characters but they serve no purpose other than to confuse you further. Those after a deep, engaging story should head elsewhere as Polygod is simply devoid of any story whatsoever. In fact the only goal here is to defeat enemies and eventually the seven deities. That’s not an easy task though as Polygod is HARD. From the off you’re given just ten hit points with just enemy drops to help you recover those. I frequently found myself walking into the first room of a level only to be bombarded by fire from five or more enemies. Sometimes you get the chance to blast them from a distance but this often ends up with them charging at you. The variety of enemy on show is impressive though, with ground and air types all offering something different. Air enemies in particular can be really hard to finish off and will often see you losing two or three hit points in the process. This can really build the frustration as Polygod seems to struggle in offering any sense of progression. My only issue with the enemies is once again down to their art style. They all look very simple with no visual traits to really make them stand out; some become tiresome pretty quickly while others can become frustrating due to their size. Often I found myself aimlessly wandering the maze like levels with little to no idea if I was anywhere near an exit. In fact, at times you can run around these mazes for quite some time only to be blasted by some unseen enemy and plunged straight back to the start. Thankfully the blessings can give you a decent upper hand and come in many varieties; weapon upgrades, life upgrades and various other attributes all help to push you deeper in to levels. The blessings feel like the only creative aspect of Polygod and being able to fire explosive shots or bullets that split after a certain distance are all welcome upgrades. Many of these are stackable too, meaning you can easily become an explosive-dealing badass so long as you have enough souls to spend. There are some issues here though, and most certainly the balancing needs to be addressed. As it is, the damage dealing blessings have to take precedence over any others just due to the sheer health that bosses have. This therefore often leads to your character lacking in other areas and can become a real pain. However I really do wish that the souls collected and upgrades obtained would stay with you after death; instead you have to repeat the whole cycle over. This goes against one of the big draws of roguelike and that’s the ability to slowly upgrade your character with each successive death and instead you find yourself reset each time with nothing more than a peashooter to get you going again. Gunplay and movement are both of a good standard though and it is here where your weapon comes in to its own with infinite ammo and absolutely no recoil. Yes, this can feel odd at first but soon it becomes second nature. Moving targets can however be troublesome, but again with practice it soon begins to work naturally enough. The movement in Polygod is fluid and simple, with just a jump button to help you out; sometimes the pace can see you stuck on scenery or backed into a corner full of enemies, but this is thankfully quite rare. So, seeing as I’ve touched on the difficulty a little, it’s probably time to delve into that side of things a little more, and without a doubt Polygod is by far and away the single hardest game I have ever played. There are no two ways about this – the difficulty just keeps going up and up, the bosses have an insane amount of health and you will be hard pressed to ever see much further than the third level. The game doesn’t do a great job of scaling this difficulty well and could really do with a tutorial to get you through the first level. Instead, you will find yourself painfully short of upgrades by the first boss and will really have to struggle through. Rage quitting is a frequent occurrence here and will quite possibly mean you have a hard time picking the controller back up and venturing into the world time and time again. 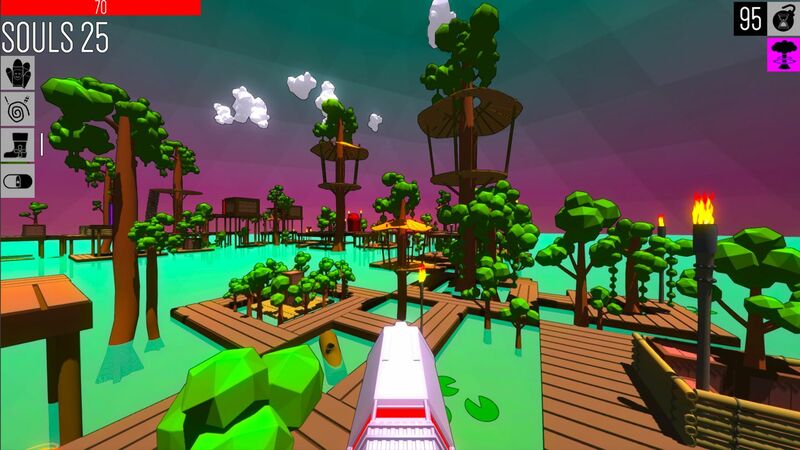 Overall and I find it hard to recommend Polygod. The art style is simplistic and the game is brutal to the point of almost being impossible. I’m sure some out there will enjoy the visuals and others may find the punishing difficulty a breath of fresh air, but I doubt the two will go hand in hand too often. This is definitely one to only go for if you’re a glutton for punishment.